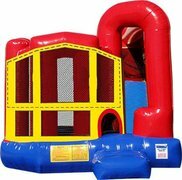 Combo bouncer rentals from JumpnBounce.com give the best bang for your buck, by providing you with great value and the maximum amount of fun. 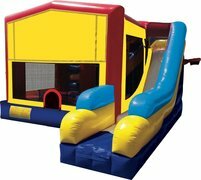 These exciting inflatable rentals get their name from being a "combination" of the popular bounce house combined with additional exciting features like climb & slides, popup barriers, and basketball hoops. Awesome customer service. Water slide jumper arrived on time and was perfect for our 4th of July weekend party. Will definitely use again and recommend to friends. Also got my table and chairs here too. Nice to be able to get everything from one place. Service was excellent. Will use again! Both Mary and delivery man was helpful. 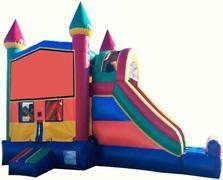 I ordered a waterside with the bounce house attached, a table and chairs. Set up quick and seamless. Kids had a blast and that's all it matters. 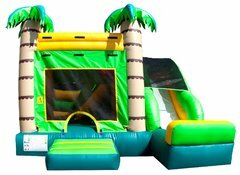 I used JumpNBounce for our Labor Day family BBQ, dealt with Mary and she was very nice and helpful, delivery guy was on time and very courteous, bouncer was in very good shape and VERY clean, which is a plus. Will definitely be ordering from them again. Thanks again! Great service. Very reliable and always on time. Wouldn't use anyone else! 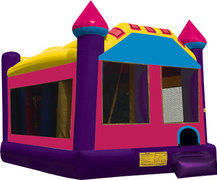 Thanks Jump N Bounce for making our parties so much fun! !